OTTAWA -- The Trudeau government's latest update on federal finances shows that slow growth is taking a toll on the books -- but they say they have a cure: a long-term plan to attract billions in new private-sector investment. Finance Minister Bill Morneau laid out plans Tuesday to lift the sluggish economy with help from a new infrastructure bank. He pledged to prime the bank's pump with $35 billion worth of public money as a way to bring in foreign capital. But at the same time, he warned Canadians that tougher-than-expected economic hurdles still lie ahead. Morneau tabled fresh projections that included an additional $31.8 billion of red ink over the next five years. The deficit for 2016-17 is expected to be about $25 billion, and the statement foresees shortfalls every year across the outlook. Tuesday's document contained no projection for a return to balance. The infrastructure bank was the headline item among several new measures Morneau is counting on to help Canada overcome what the Finance Department described as a "new norm" of slower economic growth. Morneau also announced changes aimed at drawing more talented immigrants to Canada and the creation of a hub with a mandate to lure more foreign investment. The new initiatives echo some of the advice Morneau received from his council of external experts, who were hand-picked to help the government boost economic growth. They come on top of existing commitments to help the economy, such as investing billions in infrastructure and enhanced child-benefit cheques. 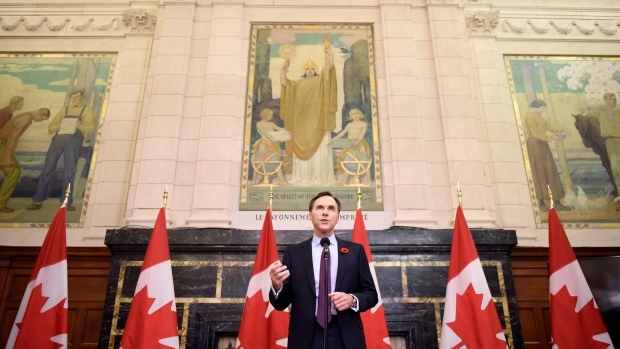 Together, the measures will help Canada succeed over the long term, Morneau insisted during a news conference prior to delivering his statement in the House of Commons. "We are moving forward on the investments that we outlined in Budget 2016," he said. "What we're announcing today is how we can amplify those investments." Looking at the latest economic and fiscal projections, which are based on the forecasts of private-sector economists, the Liberal government is staring at a significant challenge. The Finance Department is now predicting the treasury to run a total of $114.9 billion in deficits between 2016-17 and 2020-21. In comparison, last spring's federal budget predicted the government would run $83.2 billion worth of shortfalls over the same period. The fall update also added another deficit year to the end of its outlook -- a $14.6-billion shortfall in 2021-22. When asked about the outlook's lack of a timeline to eliminate the deficit, Morneau insisted the government would run shortfalls in a "fiscally responsible" way. To ensure it will be a prudent approach, he reiterated Ottawa's vow to stick its so-called "fiscal anchor" to lower the country's net debt-to-GDP ratio -- a measure of the public debt burden -- from today's level in five years. "What we want to tell Canadians is that we believe that we should be focusing on making investments for today and for tomorrow that are going allow us to have a higher level of economic growth in the future," he said. "That's of critical importance to us." Political opponents assailed the government's plan to fund the infrastructure bank using billions in public cash -- money the Liberals had already committed to provinces and municipalities. "What is he going to say to those town councils and those mayors about his promise to them?" said interim Conservative leader Rona Ambrose. "What has changed? We haven't heard anything today about creating a better economic climate in this country for investment. Canadians aren't investing. Why does he think foreign investment is going to pour into this country for this infrastructure bank?" Guy Caron, the New Democrats' parliamentary finance critic, warned that the Liberal plan would lead to higher costs for Canadians through user fees and tolls, which are widely viewed as necessary to provide steady returns for investors. "The Liberals never promised during the campaign to privatize infrastructure," Caron said. During the election campaign, the Liberals promised to create an infrastructure bank but provided few details. They said it would use Ottawa's strong credit rating and lending authority to provide low-cost financing that would help make it easier and cheaper for communities to build projects. The Liberals won last year's election on a platform that also promised annual deficits of no more than $10 billion over the next couple of years to allow them to spend billions on infrastructure projects as a way to deliver a boost to the struggling economy. The Liberals had also vowed to balance the books by 2019-20. But the government later blamed even weaker conditions for a revised forecast in the March budget of five straight annual deficits. The outlook on Tuesday predicts a sixth shortfall. Many global experts, including the International Monetary Fund, have applauded Canada's decision to try and generate growth through extra government spending, particularly since it carries a much lower debt burden than most of its industrialized peers. Morneau's updated figures now predict deficit this year to be $25.1 billion -- slightly larger than the $23.4 billion projected in last spring's budget. These figures do not include the adjustment set aside for risk. The deficit is expected to expand to $27.8 billion in 2017-18. For now, the government has eliminated the $6-billion annual contingency fund that it had included in the March budget to cover unexpected problems. The accounting move makes the government's deficit figures appear slimmer. The deficit is gradually expected to shrink over the coming years to $14.6-billion in 2021-22, not including any provisions set aside for a rainy day. Among the other measures announced Tuesday, Ottawa is setting up a global skills strategy that will speed up work permits and visas for foreign workers. The government is also creating a new Invest in Canada Hub to attract foreign investment. It will relax foreign investment restrictions a little bit -- revising the national security rules and moving the threshold for reviewing foreign takeovers to $1 billion starting in 2017, two years ahead of schedule.